Eric Meola's exhibition of Born to Run photographs opens at Snap Galleries in the UK shortly, and Eric's still got his eye on good causes. In October, he donated 25% of his earnings on all print sales to the Community FoodBank of New Jersey. In November, Meola's beneficiary will be a non-profit group started by Terry Magovern to support poeple with ALS. The Joan Dancy and PALS (People with ALS) Support Group will receive 25% of all of Meola's earnings from the sale of his limited edition prints throughout the month. Prints are available for sale now; the exhibition runs from November 11 through January 20. Meet Eric in person at the opening, November 11 from noon to 3 p.m. Visit the Snap Galleries website for more details. During yesterday's soundcheck in Oslo, Springsteen talked with reporters about the Seeger Sessions album and tour, now more than halfway through its final European leg. "You're a always in shock at how something you, say, started in your little bedroom... or we started in the living room of my farmhouse... how it plays out, thousands of miles from home." Watch the interview online now. And dig that guitar! Thanks for hanging tight -- BTX v3.0 is online now. Tickets go on sale Saturday at noon through Ticketmaster.com, Ticketmaster outlets and charge-by-phone, as well as at Starlandballroom.com and the Starland Ballroom box office. See www.concertseast.com for more information. MAN, THE DOPE'S THAT THERE'S STILL S.O.A.P. On December 9, the city of Asbury Park will honor and celebrate its musical past. The celebration kicks off at noon, with the dedication of a monument on the boardwalk next to the Convention Hall, memorializing the names of the musicians who helped formulate the Sounds Of Asbury Park (S.O.A.P). These founding fathers of S.O.A.P. are Johnny Shaw, Billy Ryan, Bruce Springsteen, Garry Tallent, Steve Van Zandt, Mickey Holiday, "Stormin'" Norman Seldin, Vini "Mad Dog" Lopez, Fast Eddie "Doc Holiday" Wohanka, Billy "Cherry Bomb" Lucia, Clarence Clemons, Nicky Addeo, Donnie Lowell, Jim "Jack Valentine" Cattanach, Ken "Popeye" Pentifallo, Jay Pilling, Jon "Cos" Consoli, Gary "A" Arntz, Larry "The Great" Gadsby, Steve "Mole" Wells, Ray Dahrouge, Johnny "A" Arntz, David Sancious, Margaret Potter, Tom Potter, Sonny Kenn, Tom Wuorio, Rick DeSarno, Southside Johnny Lyon, Leon Trent, Buzzy Lubinsky, Danny Federici, Bill Chinnock, Patsy Siciliano and Sam Siciliano. That evening, a once-in-a-lifetime event will be held at the Stone Pony called "The Creators Of S.O.A.P. In Concert." The idea for this concert grew out of discussions between Garry Tallent and Fast Eddie "Doc Holiday" about the many originators of the Asbury Park sound that had been forgotten over the years -- and the realization that time to honor these living legends was quickly running out. After the initial discussions of a charity event were met with enthusiasm by the management of the Stone Pony, concert plans started to come together. Currently scheduled to appear at the Stone Pony on the evening of December 9 are "The Thunder of the E Street Band" Garry Tallent, Vini "Mad Dog" Lopez, Ken "Popeye" Pentifallo, Donnie Lowell, Billy Ryan & the Bluescasters, Steel Mill Retro, "Stormin'" Norman Seldin, Billy "Cherry Bomb" Lucia, John "Cos" Consoli, Gary "A" Arntz, Jim "Jack Valentine" Cattanach, Fast Eddie "Doc Holiday" Nicky Addeo, Rick DeSarno, Jay Pilling, Bill Chinnock, Lance Larson, Mickey Holiday, Lisa Lowell of the Seeger Sessions Band, Patsy Siciliano, Sam Siciliano, Anthony Mirabile, Craig Krampt, and others. Tickets are $15.00 each and available on Ticketmaster.com and at the Stone Pony Box Office, with all proceeds going to local charities. Enter a Columbia Records contest now for the chance to win two tickets to Springsteen's November 18 show at The Point in Dublin -- oh, plus two round-trip tickets and accommodations for a 4-day/3-night Dublin vacation. Not a bad little package! Enter the contest here, before October 22. Bruce Springsteen discusses his new retrospective CD, Tracks, the political context of his songs, his liberal activism and message, his songwriting process, the E Street Band and how his background and life events have shaped his art and songs. He sings "Born in the U.S.A." at the close of the show. 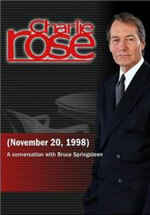 A word of warning: The program has been repeated over the years, so multiple DVDs of this same content (with different airdates) are available; if you're interested in Bruce's appearance on the show, don't be fooled, this is the only one you need. Wish we were there... but especially because we're not, don't forget, we'd love to hear your reports after each concert, for both the website and the magazine. As always, we're counting on you to fill us in on what goes down! If you'd like to help out, please send show reports to onstage@backstreets.com. Many thanks! Dancer and choreographer Danial Shapiro of the Shapiro and Smith Dance Company died of prostate cancer at the age of 48 on Tuesday October 3, after a long, brave fight with the disease. Shapiro was diagnosed four years ago at an unprecedentedly young age for this form of cancer. Whoever met Dan will remember him. Whoever saw Dan dance will remember him. Whoever played computer games till 4:00 am with Dan will remember him. If you were on roller blades, cruising around Lake Calhoun on a sunny day and almost tripped over his dog Bessie and he caught you mid-air and righted you before you wiped out, and you rolled away cursing . . . you'd remember him. A move that I must say was not only athletic but naturally graceful. Danny threaded grace with strength. His vast eclectic knowledge was spiced with wickedly great humor. His curiosity never ended. He loved deeply and those who were fortunate to be close to him . . . we are the lucky ones. He is forever embedded in our hearts. Soozie's right -- our interactions with Danial were brief, but he was always exceedingly kind, generous, and enthusiastic, and we'll remember him fondly; our condolences to his family and friends. See Backstreets #82 for a review of Anytown, for which Colleen Sheehy spoke with the late choreographer. Tonight (Friday, Oct. 13) on the History Channel, the film Into the Fire will be broadcast at 8 p.m./7 central time and repeated October 22 at 4 p.m./3 central time. Into the Fire, which takes its name from the Bruce Springsteen song, is an emotionally charged documentary presented by Fireman’s Fund and directed by Academy Award-winning filmmaker Bill Couturié. Couturié interviews firefighters from big-city engine companies to small-town volunteer fire departments, asking them why firefighters risk their lives to save others. The result is a collection of the firefighters’ stories -- and a powerful and moving portrait of the modern fire service. Funds generated through Into the Fire will be donated to fire departments and nonprofit fire service organizations for needed equipment such as thermal imaging cameras. Musical artists such as Springsteen, Bob Dylan, and others have demonstrated support for this film by giving permission to use their music on the documentary soundtrack. 10/10, Rome: Seven nights have been rocked: Rome is the last show of an Italian septet that began on October 1. Emiliano Stella reports in: "Great setlist, great great performance and great audience. The sound wasn't at its best, but it improved during the show. It seems Bruce keeps on increasing the number of his songs in the set. 'All the Way Home' (soundchecked in Perugia) made its debut in a stunning version. 'Growin' Up' was for a seven-year-old boy with a 'Growin' Up with Bruce' sign. 'Long Black Veil' and 'Ramrod' are welcome back in the set, too. Bruce called Rome "la più bella città del mondo" -- the most beautiful city in the world." 10/12, Hamburg: The tour leaves the boot, but Bruce and the Seeger Sessions Band bring a little bit of Verona to Germany, with the second tour performance of "Fire." Next: Friday night in Rotterdam. Beginning today, We Shall Overcome: The Seeger Sessions - American Land Edition is available on iTunes. Which means, if you didn't feel like laying out the dough for the new CD/DVD package, you can pick up those bonus tracks individually for 99 cents a piece. The bonus videos -- "Poor Man," "Bring 'Em Home," "American Land," and "Pay Me" -- are available on iTunes separately as well, for $1.99 each. Check out a Springsteen news clip from TG1 on YouTube, for snippets of "This Little Light of Mine," "John Henry," and "Old Dan Tucker," as well as a brief interview -- underneath the translation, you can hear Bruce say, "Patti's only going to be here the first four shows, then she's going to be home with the kids...." So, enjoy "If I Should Fall Behind" while you can! This fall, 35 large format prints from Eric Meola's new book Born to Run: The Unseen Photos, will be on display (and for sale) in Birmingham, England. Meola's first-ever gallery exhibition of his Springsteen photographs will coincide with the Seeger Sessions Band's return to the UK. The exhibition begins on Saturday, November 11, but sales have already begun -- and Eric is donating 25 percent of his earnings on any sales made during the month of October to the Community FoodBank of New Jersey. Visit the Snap Galleries website for more details. Eyes on Italy, as Springsteen and the Seeger Sessons band get ready to kick off the fall tour in Bologna on Sunday night.... We've got a venue change for October 8, the sixth of seven Italian concerts. Instead of being held at the Giardini della Reggia -- the Minister of Cultural Assets "has expressed negative opinion on the use of the historical center for the concert" -- the Caserta show has been moved to PalaMaggio', a small arena. For more information, see www.barleyarts.com. For the full itinerary, see our Tour/Ticket Info page. Get a free poster when you order, only from Backstreets! If you've been paying attention lately, you've surely noticed a plethora of literary output due this fall regarding Bruce Springsteen. It's an embarrasment of riches, with both Eric Meola's Born to Run: The Unseen Photos and Robert Santelli's Greetings From E Street imminent and highly recommended. 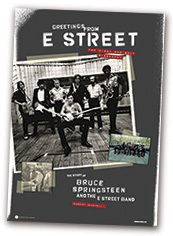 Meola's book focuses on iconic off-stage imagery from 1975; Santelli's tells the story of the E Street Band. And now, here comes the third in a trifecta of new and essential Boss books -- Dave Marsh's Bruce Springsteen On Tour: 1968-2005 -- which goes for capturing the Live Experience. "What in the world made me think I had something else to say? It was right about the time that Devils & Dust came out... I said to myself, 'Dave, you let the Proper Intellectuals interpret this stuff, you're going to live out your old age in a world where people think it all had more to do with Philip Roth and Raymond Carver than Peter Wolf and Sam Moore, and that is not acceptable. If you wrote something about Bruce live, you could push the songwriting aside, in order to get things in proportion, and you could bring forth that he does it with a guitar and a microphone and kneepads (we can't figure he does those slides across the front of the stage with nothing more to protect him than denim, can we? ), not a bloody word processor.'... And the glory of it is, that's a great way to celebrate what Bruce has done, which is what photo books of this kind are best at, I think." Bruce Springsteen On Tour: 1968-2005 is due in early October from Bloomsbury Publishing. See the book in our online shop, where we're offering a pre-order sale now! Exclusive Backstreets giveaway! Order Bruce Springsteen On Tour from us now to receive an exclusive Springsteen poster, FREE. The first 500 people to order the book from us will receive this limited edition poster, pictured right, an expanded view of the shot from the book's cover. It's only a matter of days before Springsteen and the Seeger Sessions Band are back on the road for their fall European tour; a string of shows in seven Italian cities begins on Sunday night. As reported by our friends at Point Blank, one of those Italian shows will be taped for broadcast and aired on Italy's Radio 1 on Friday, October 13. Also, a contest is being held for fans to have a chance to attend soundcheck and meet Springsteen at each of those Italian dates. The deadline is tonight, September 27, at midnight (CET); see the Point Blank website for nicely spelled-out details on how to enter. If you're in the Washington DC area in the coming month, be sure to visit the Govinda Gallery in Georgetown, where the striking images of Frank Stefanko (Darkness on the Edge of Town, The River) will once again be on the walls. Back where he debuted his Springsteen photographs from Days of Hope and Dreams, Frank will be unveiling another show of striking portraits of a single artist, this time of his old friend Patti Smith. The exhibition, "Patti Smith: American Artist," will be on display from September 29 through October 28, with an opening reception at the gallery this Friday, September 29, from 6 to 9 p.m. The Govinda show coincides with the publication of Stefanko's new book, also called Patti Smith: American Artist, which is due late October and available for pre-order now from Backstreet Records. Up in NYC, the work of another our favorite photographers, Danny Clinch (The Rising, We Shall Overcome: The Seeger Sessions), is on display now at the Morrison Hotel Gallery in Soho. The exhibition runs through October 15 -- see the Morrison Hotel website for more details. Springsteen turns 57 today -- that's a year per channel. Writer Adam Hurtubise celebrates September 23 as a National Holiday each year -- this year he invited us over for the festivities on his Random Thoughts blog. Put on yer party hats and check it out. Talk about a hot ticket! The October 14 discussion and signings by Born to Run photographer Eric Meola and author Dave Marsh at the Asbury Park Public Library is completely reserved, and attendance at the 1 p.m. event will be restricted to those with reservations already accepted by The Friends of the Bruce Springsteen Special Collection. According to the Friends, a few reservations remain for the discussion and signing by Greetings From E Street author Robert Santelli at 2 p.m. on October 1, but those too are going fast. Anyone planning to attend would be well advised to make a reservation soon by emailing springsteencoll@yahoo.com. Yet another Boss guest appearance is in the can: Jesse Malin recently paid a visit to Bruce's Colts Neck, NJ studio, where the two collaborated on a track for Malin’s upcoming Adeline Records debut, Glitter in the Gutter. The ballad, tentatively titled "On the Radio," is a virtual duet, as Bruce backs Malin on vocals throughout and takes the middle verse. Other guests on the record include Ryan Adams, Chris Shifflett of the Foo Fighters and Josh Homme of Queens of the Stone Age. The record is Malin's third solo offering and is set for late January 2007 release. Springsteen may have played his last Rumson Country Day School benefit, but the spirit -- and heck, the setlist -- lives on. Last night at the Stone Pony, Bruce reteamed with Bobby Bandiera and his band for a similar affair, once again a private show for parents and teachers, this time for the Ranney School. It was a night of rock, as we've come to expect from this kind of show, featuring classic covers like "Seven Nights to Rock" and a full "Detroit Medley"; the only echo of the ongoing Seeger Sessions tour was the sight of Ed Manion and Patti Scialfa on stage. 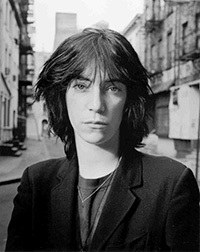 Patti got much of the spotlight, stepping up for "Tell Him," "Boy from NYC, and "Sugar Sugar" (all listed on the setlist as possibilties for song #9 -- they wound up doing them all), and later in the set, "Son of a Preacher Man." In another setlist change, Southside Johnny joined in for an audible of "I Don't Wanna Go Home." 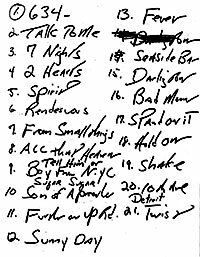 As the set stretched out, something had to give (it was a school night, after all), and songs 16-19 on the handwritten setlist were dropped. Surely no complaints, as Bruce went from "Darlington County" into a high-energy "Tenth Avenue Freeze-out," and had the headmaster onstage for a show-closing "Twist and Shout." It's gonna be a real Rocktober at the Asbury Park Library, and it keeps getting better. As reported earlier, Robert Santelli and Eric Meola will be making special trips to Asbury next month to discuss and sign their new Bruce books. 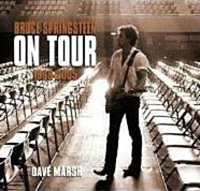 But hold the phone -- The Friends of the Bruce Springsteen Special Collection have added one more author to their fall series: Dave Marsh, whose forthcoming Bruce Springsteen on Tour: 1968-2005 is a beautiful coffee-table book celebrating the live experience. After Santelli kicks off the series on October 1, Marsh will share the October 14 program at the library with Meola and Daniel Wolff (acclaimed author of 4th of July, Asbury Park, who wrote the introduction for Meola's book). For more details on the authors series -- including information on how to make reservations (strongly advised) -- see below. Less than three weeks now until the Seeger Sessions tour resumes... If you fancy seeing Bruce this fall with those fabulous European audiences, why not join our long time friends from Badlands who run trips to shows all around the globe. They take care of the ticket and hotel, and they have a great autumn itinerary planned for the Seeger Sessions tour, including Bologna, Rotterdam, Madrid, Valencia, Barcelona, Dublin, and all the U.K. shows. Click here for details. The "American Land" Edition of the Seeger Sessions album is coming soon, due October 3 -- but that's not all the new Bruce music we're getting this fall, as he's been turning in guest spots left and right. In just a couple weeks, on September 26, Jerry Lee Lewis' Last Man Standing drops, with the Killer and the Boss teaming up on "Pink Cadillac." Every track on the record features a different guest, and a whole lotta superstars came out to shake it with Jerry Lee. Besides Springsteen, there's Page, Young, Fogerty, Clapton, Jagger, Richards, and on and on. Listen to a streaming "Pink Cadillac" (WMA - Real) now, or a 15-minute sampler of the whole album (WMA - Real); visit our online shop to see the full track lisiting and for a pre-order sale on the CD. After that, we'll have a chance to see Springsteen's peformance of James Taylor's "Millworker" from earlier this year. 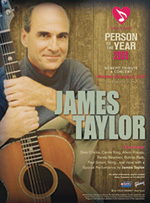 As reported on James-Taylor.com, the February 6, 2006 MusiCares Person of the Year tribute concert (at which Bruce, Sting, Bonnie Raitt, Alison Krauss and others honored JT) will air on PBS on November 29. The concert will be released on DVD even sooner, on October 3, the same day as the "American Land" reissue. See our online shop for more details and to pre-order the DVD now, also on sale! Just released and in stock now: Sam Moore's Overnight Sensational CD featuring Springsteen dueting on "Better to Have and Not Need"; and Joe Grushecky's A Good Life CD featuring Springsteen on three tracks including their "Code of Silence" duet. See all the latest additions to our online shop. Are you ready for some E Street? Tonight's Monday Night Football regular season opener on ESPN will feature some "friends of ours," as Little Steven and Clarence Clemons join Hank Williams Jr.'s all-star band for the new theme, "All My Rowdy Friends Are Coming Over Monday Night." Look for the video debut before kick-off at tonight's double-header (7 p.m. Eastern). 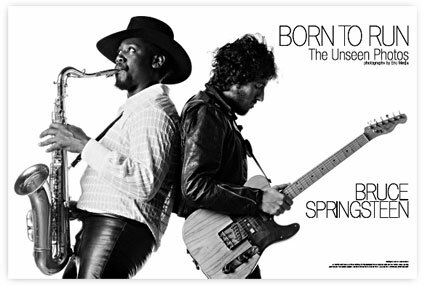 The books are chock full of unpublished photographs, untold stories, and removable souvenirs, and now comes word that Greetings From E Street author Robert Santelli and Born to Run: The Unseen Photos photographer Eric Meola will discuss and sign their new Bruce books this fall at the Asbury Park Public Library. As part of the first-ever authors series sponsored by The Friends of the Bruce Springsteen Special Collection, Santelli will discuss and sign Greetings From E Street at 2 p.m. Sunday Oct. 1, while Meola will discuss and sign Born to Run: The Unseen Photos at 1 p.m. Saturday Oct. 14. Joining Meola at the Library will be author and historian Daniel Wolff, who wrote the book's introduction. Both events are open to the public. Seating is limited; reservations are strongly advised and can be made by e-mailing springsteencoll@yahoo.com. Copies of Greetings From E Street and the standard edition of Born to Run: The Unseen Photos will be available for purchase at the Library on the day of the author's appearance. The Asbury Park Public Library is at 500 First Avenue in Asbury Park. For more on getting involved with the Springsteen Special Collection, go to friendsofthespringsteencollection.org. I'LL TAKE "MY WHOLE LIFE HAS BEEN LEADING TO THIS MOMENT" FOR $400, ALEX. Who says all this Boss knowledge in your brain will never pay off? Last night's Jeopardy "Tournament of Champions" featured a whole category dedicated to Springsteen. If you're keeping score at home, these questions (reading top to bottom, left then right) were worth $200, $400, $600, $800, and $1,000. Don't forget to phrase your answer in the form of a question. Easiest three grand you never made, huh? We're not yet processing the idea that summer's almost over. In fact, forget we said anything. But if you want to make some Labor Day weekend plans to take your mind off it, check out Soozie Tyrell, taking advantage of this Seeger Sessions tour break to play with her own band at the Stone Pony -- that's this Saturday night, September 2. The next night, Sunday Sept. 3, Willie Nile (featured in the latest issue of Backstreets magazine) is playing a Mini Takes the States show in Jersey City. The following weekend, Soozie and Willie are playing a show together, Joy DiVeRsion at Joe's Pub in New York. For more upcoming shows of interest, check our Concert Calendar. It's gonna be quite an autumn for Boss books -- no less than three must-haves for Springsteen fans are coming out in the next couple months. There's Eric Meola's Born to Run: The Unseen Photos, Dave Marsh's Bruce Springsteen On Tour 1968-2005 (check back soon for more info on that one), and then this treasure chest of a book: Greetings from E Street: The Story of Bruce Springsteen and the E Street Band. The text alone would be something to get excited about: a history of the E Street Band, written with their cooperation, by Robert Santelli, the longtime Backstreets Associate Editor who also worked with Max Weinberg on The Big Beat and Springsteen himself on Songs. But the full package goes above and beyond what we'd have a right to expect from a book like this, as the text is "well illustrated" to say the least. Housed in a sturdy slipcase made to look like a road case, the book itself holds dozens of pull-out pieces of memorabilia. You'll find pockets and mylar envelopes spread throughout, holding removable replicas of backstage passes, newspaper clippings, posters, napkins (! ), tour itineraries, and more. Plus, graphic-rich pages with more artifacts from E Street history and 200 rare photos of Bruce and the band. We just got our hands on an advance copy, and our gasts are flabbered. 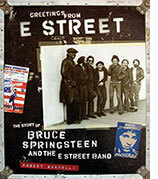 Greetings From E Street is due in late September from Chronicle Books. See more of the book in our online shop, where we're taking pre-orders now. Exclusive Backstreets giveaway! Pre-order Greeetings from E Street now to receive an exclusive E Street Band poster, FREE. The first 500 people to order the book from us will receive this limited edition poster, pictured right -- and the first 100 orders will have their posters autographed by author Robert Santelli. Springsteen fans who also enjoy HBO's Deadwood series were treated to a nice little surprise (though bittersweet) during the closing credits of the season finale, which debuted on Sunday night. The episode, which concludes the series' final full season, ended to the strains of Bruce's "O Mary Don't You Weep." Deadwood, which has often mixed fact and fiction about the Old West as successfully as the Seeger Sessions' "Jesse James," has won much critical praise and numerous awards during its three-season run. Plans are afoot to wrap up various loose ends with two special two-hour episodes yet to be filmed. 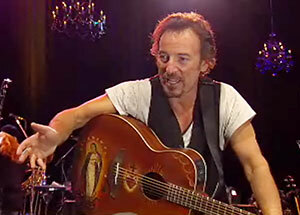 On his Sony BMG website, Springsteen addresses recent "distractions." Here at Backstreet Records, one of the items we get the most requests for is a Born to Run poster. Guess what -- your wish is our command! Actually, it's thanks to the generosity of BTR photographer Eric Meola that what you see above can be coming to a wall near you. Not only is Meola donating his proceeds from his upcoming book, Born to Run: The Unseen Photos, to the Community FoodBank of New Jersey, he has also created this spectacular poster to benefit them as well. 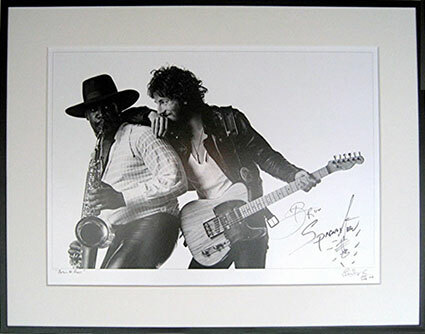 As pictured, the image is an alternate shot of Bruce and Clarence from the cover session, beautifully reproduced as a 20" x 30" poster on 100 lb. glossy stock. This poster is a Backstreets exclusive, available here and only here, with all proceeds going to the FoodBank. Order yours now! You can also pre-order Born to Run: The Unseen Photos now in our online shop: the standard edition (due Oct. 10) or the limited edition (due Nov. 14). We expect demand for latter to be high, with a numbered edition of only 1,350. Guarantee a copy by ordering now! This fall, many of the "Unseen Photos" will be on display in Birmingham, England. Meola's first-ever gallery exhibition of his Bruce Springsteen photographs will feature 35 large black & white prints. Coiniciding with the Seeger Sessions Band's return to the UK, the exhibition begins on Saturday, November 11. Visit the Snap Galleries website for more details. We're working now to nail down our show-by-show tour coverage for the next issue of Backstreets Magazine, #86, and it looks like we still need reader reports from four Seeger Sessions shows: Milwaukee, Cleveland, Detroit, and Saratoga. If you were there and want to contribute, send your report to onstage@backstreets.com, and thanks for helping out! Whaa? There's a magazine? : Yep! A full-color glossy just for Springsteen fans, packed with exclusive photos and much more in-depth reportage than we're able to publish here on the website. Backstreets #85 is hot off the presses and available now from our online shop... or SUBSCRIBE NOW to start with #85 and be on board for the issues to come! The "American Land" video is streaming online now at CMT.com. A radio special, "We Shall Overcome: Bruce Springsteen & the Seeger Sessions," is scheduled to air in numerous cities in the coming weeks. The one-hour program is hosted by World Cafe's David Dye, who discusses the album with Springsteen, Pete Seeger, Dave Marsh, and Seeger Sessions Band members Larry Eagle and Charlie Giordano. Songs include "Bring 'Em Home" and "How Can a Poor Man Stand Such Times and Live." Click here for stations and air dates. This weekend in Asbury Park, it's the 31st annual Clearwater Festival, a music and arts fest held by the Monmouth County Friends of Clearwater. The environmental group has been working to fight water pollution since 1975, inspired by... you guessed it, Pete Seeger, and his Hudson River Clearwater group. According to the Asbury Park Press, "Although the 87-year-old Seeger is still performing, it's unlikely he will attend this year's event." But there's plenty on the schedule for Shore music fans, including the Upstage Jam Band, Steel Mill Retro, Joe D'Urso & Stone Caravan, Maybe Pete, The Smithereens, Exit 105, and Boccigalupe & the Bad Boys. The festival is held in Asbury's Sunset Park, Saturday and Sunday August 19 and 20. For more details, read today's APP story, or visit the Clearwater Festival website. Brother man! Brother man! Nearly 15 years after they teamed up on Human Touch, Bruce Springsteen returns the favor with a guest spot on Sam Moore's new album. 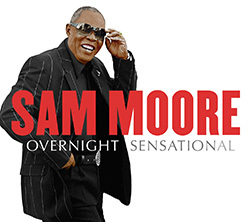 Due out at the end of this month, Moore's Overnight Sensational includes a soul workout with Springsteen on "Better to Have and Not Need." And you can hear it online now: check out the "Listening Party" at Rhino.com, where you'll find the whole album streaming now. The Randy Jackson-produced Overnight Sensational, which also includes the final recording from Billy Preston, hits on August 29. Springsteen's "Lucky Town" rumbles through the trailer for Lucky You, the new Curtis Hanson movie set in Vegas. The movie stars Robert Duvall, Drew Barrymore and Eric Bana; you can view the trailer now at the official Lucky You website. The soundtrack album will feature two Bruce songs, "Lucky Town" and "The Fever" (the 18 Tracks version? remains to be seen), plus two each from Bob Dylan and George Jones, and more from Ryan Adams, Kris Kristofferson, Bonnie Raitt, Johnny Rivers, Shawn Colvin, and Barrymore herself. The movie opens October 27, with the soundtrack due on October 17. "We can rebuild it. We can make it better than it was... Better. Stronger. Faster." Yes, they have the technology... and on October 3, Columbia will release an expanded set with an expanded title: We Shall Overcome: The Seeger Sessions - American Land Edition. The fall release takes its name from the new song that Springsteen unveiled for the last three shows of his recent U.S. tour, which is included here as one of several bonus tracks. According to a press release, "American Land" was written by Springsteen, "inspired by" a poem set to Pete Seeger's music called "He Lies in the American Land." CD: Five additional tracks for the album itself. Two of them, "Buffalo Gals" and "How Can I Keep From Singing?," were audio bonus tracks on the DVD side of the original DualDisc. The remaining three are previously unreleased: "How Can a Poor Man Stand Such Times and Live," "Bring 'Em Home," and "American Land." DVD: The extended version of the behind-the-scenes film, a 40-minute cut that aired on CMT shortly after the original album release, with additional footage of "Jacob's Ladder" and "Erie Canal." Plus: Thom Zimny-directed music videos of "American Land" and "Pay Me My Money Down," and concert clips of "Poor Man" (L.A., 6/5/06) and "Bring 'Em Home" (Concord, CA, 6/6/06). Packaging: An expanded booklet, featuring additional photos by Danny Clinch, lyrics to the new songs, and the in-depth liner notes by Dave Marsh that were previously online only at www.brucespringsteen.net. It won't cost six million dollars. But if the idea of repurchasing an album so soon gets your hackles up, the press release states that the new edition "will be available on a track-by-track basis from iTunes, allowing fans that have already purchased We Shall Overcome: The Seeger Sessions DualDisc to download the additional tracks." Read the full press release here. The John Fogerty/Willie Nelson show Saturday night at the PNC Bank Arts Center in Holmdel brought a third music legend to the stage for a quick guest spot. Fogerty told the crowd that he ran into a kid with a guitar backstage, figured he'd bring him out to play... and, "Oh yeah -- his name is Bruce." You can imagine the Jersey crowd liked the sound of that. Wearing a Yankees cap and armed with a shiny red and white telecaster, Bruce showed he still remembers how to play a mean electric guitar as the two VFC touring partners teamed up for "Long Tall Sally." Get a taste with a, um, "fan based recording" on YouTube. 8/4 Update: A second London show was added during the onsale today, for November 12.